Another brilliant performance from Mark McGeeney has seen the Team Unicorn ace secure a Tour Card. The former BDO No.1 claimed his prize on day two at Q School in Wigan, just 24 hours after losing the final qualifying game to Unicorn stablemate Harry Ward on Thursday. 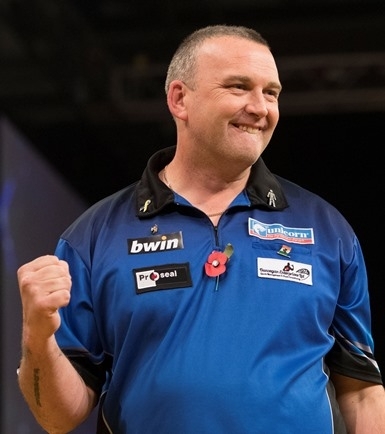 Now he has this great chance to prove himself in the PDC. McGeeney won a last leg decider against Carl Wilkinson to win the day. It was a thoroughly deserved triumph for McGeeney after two outstanding days. The Stockport star was in imperious form once more as he swept past Dave Prins, Scott Dale, Martin Atkins, Andy Chalmers and Mark Hickey. Five superb wins to take him to the last 16. Then came 5-2 victories over Matt Clark and Jamie Bain before that 5-4 win over Carl Wilkinson to clinch the big prize....16 tough games over two days but it was all worth it for McGeeney. The other qualifier from day two of Q School was Scott Baker who beat American Daniel Lauby 5-1 in the final match.